Delivery/Pick-Up - Add a Little Frosting to Your Life! Orders are available to be picked up at our location in the University Area in Charlotte, North Carolina. Directions will be provided once your order in placed and a pick-up is scheduled. Be sure to check our Blackout Dates, to ensure we are available for your date of pick-up or delivery. A Touch of Frosting, Cupcakery is proud to be working with Daily Do's. Daily Do's is our official delivery provider for all cakes and cupcakes! 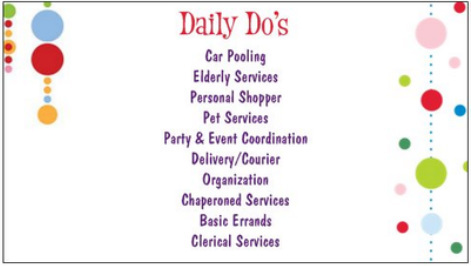 In addition to delivery services, Daily Do's provides an array of services. 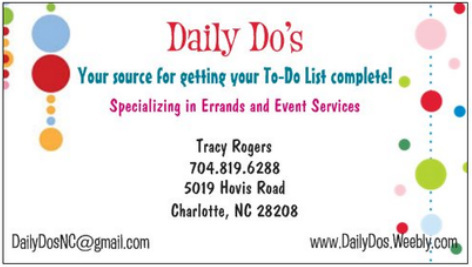 Keep them in mind for those daily errands and events you have, but don't have the time or manpower to take on during your busy schedule.Check out their Official Website and Facebook for additional details! **There is an additional fee for delivery service through Daily Do's.